If you have any interest in the way the film business operates or the climate that exists for independent films, you must read this talk given by Bill Mechanic, former head of Fox and now an independent producer. It's the keynote address to the Independent Film & Television Production Conference and is essential reading. ScribeMedia.org is a video site focusing on the business, technology and culture of the web. There is a six part, 90 minute interview with Fred Seibert, called "Building Digital Entertainment Brands," which talks about Next New Networks, his collection of internet channels. Other videos are on "The Power of Online Storytelling," "Maximizing the Monetization of Online Video Content," "Independent Filmmaking in the Digital World," and "Hollywood 2.0 -- Content and Commerce." All the above links are to talking heads videos. I wish that they were transcripts instead, as they would be searchable and easier to speed read for relevant information. However, the interviews are with industry professionals, so their insights are worth hearing. 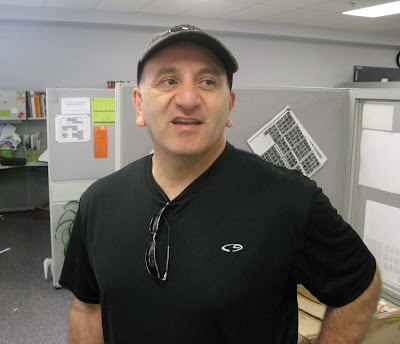 Canadian Business profiles producer Michael Hirsh, a founding partner of Nelvana and currently the head of Cookie Jar. Whether you like the shows he's produced or not, there's no question that Canadian animation would have been significantly different without Hirsh. Rich Johnston, Nikki Finke and the N.Y. Times are reporting that the estate of Jack Kirby has filed for termination of copyright on the characters he co-created for Marvel Comics. Will this have an impact on Disney's intended purchase of Marvel? There is no single person in the history of comic books who created more successful characters than Jack Kirby. There is no one in the history of comic books who received less of his rightful financial due than Kirby. I have no idea how this will play out, but I hope that the Kirby estate realizes millions from this. I'm only sorry that Kirby himself isn't alive to benefit from it. 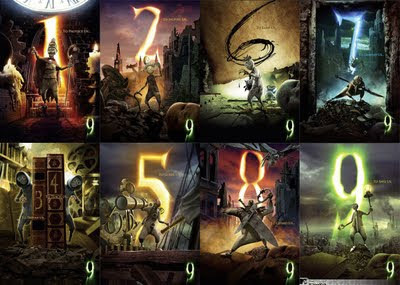 9 is a post-apocalyptic fantasy that suffers from huge huge logic holes and underdeveloped characters. This is a shame, as the film has strong art direction and what Variety would call "solid tech credits." The story is about a scientist who invents a machine for the betterment of mankind and has it taken away from him and subverted by a military government. The machine is used for war and then turns on humans, wiping them out. Somehow, the scientist ends up being the last man alive. I would think that either he would be drafted to stop the doomsday machine or would be killed by an angry mob, but it appears that he's left alone to build dolls. Why he considers this the appropriate response is never explained. There's a streak of mysticism running through the film, as the scientist imparts a piece of his soul to the nine burlap dolls. After the ninth, the scientist has apparently run out of soul and dies. I have to assume that numbers one through eight were unsuccessful prototypes, because the scientist leaves instructions explicitly for number 9. Based on the image above, 1 through 8 have specific tasks to perform, but they don't cooperate with each other or know what to do. 9 himself is responsible for a colossal blunder which exists only for the convenience of setting the plot in motion. That blunder is even more convenient in that a device the scientist has invented to save the world also fits perfectly in the doomsday machine, making it even more powerful. Way to go, scientist! At the end of the film, 9 frees the parts of the scientist's soul that were embedded in five of the dolls. The souls ascend to heaven, causing a rainstorm. The implication is that somehow, the rain will renew the earth and there are hints that the raindrops contain bacteria to start the evolutionary process over again. I can only wonder why the souls of billions of humans who died previously were not capable of causing this rain. Furthermore, the future for the four remaining dolls is uncertain at best. They seem incapable of reproducing, sexually or otherwise. Will they eventually wear out? Will they perish through accidents? Some dialogue states that the world is now theirs to remake, but the appearance of the bacteria-laden rain implies otherwise. If the characters were memorable, these questions wouldn't matter quite so much. However, the characters are not well developed. While they have voices by Elijah Wood, Christopher Plummer, Martin Landau and Crispin Glover, the actors have nothing to work with. These characters have no arcs and have less personality, with a few exceptions, than the 7 dwarfs. That's a handicap that the animators can't overcome. An audience enters a film through the characters. When characters are weak and underdeveloped, the audience has no reason to identify with them or care what happens to them. This reduces the impact of the various action sequences of the film. They are well directed and animated from a technical standpoint, but don't have the effect they should because the audience is not invested in the characters' fates. What makes it worse is that the film is almost all action sequences in order to pad out the slim plot. The artists who worked on this film have done their jobs well. The film's shortcomings are not in the visuals, which are consistently good. As often happens, the artists have been let down by the script. Good art direction and slick production values are not enough for an audience. If they were, Sky Captain and the World of Tomorrow would be considered a classic instead of a film most people have forgotten. Starz, the Toronto production company responsible for the bulk of this film's visuals, is developing into a first class studio. Because they are a shop for hire, they're stuck with the scripts they are handed and are in no position to demand rewrites. Eventually, they may get lucky and work on a hit, but it's a shame they have to trust to luck. The artists on this film have done work to be proud of, but it can't overcome the script's deficiencies. I hope someday they work on a film worthy of their talents. It's only the second week of classes at Sheridan College, but due to a variety of circumstances, we've been lucky to have three industry guests in three days. Paul Fierlinger was in Toronto to attend the Toronto International Film Festival screenings of his new feature My Dog Tulip. I was able to reach Paul and arrange for him to speak at the college, but the notice was so short we wedged him into a first year animation lecture and then spread the word to students from other years. 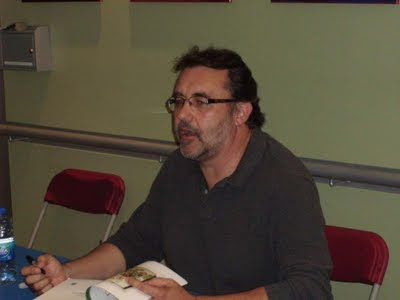 Fierlinger spoke about his long career as a freelancer and independent film maker, urging the students to be original and to use their originality as their main selling point. He said that except for corporate logos, he never did a job that wasn't in his own style. It wasn't enough for him to say that his style was better, he had to show the client (often with sample animation) that his approach would work better than a design approach they put forward. Fierlinger was very bullish on the internet, urging students to find communities that exist on line and figure out ways to serve them through animation. He mentioned a friend who was a 5th grade teacher who made simple animations for his students as a hobby, and now other teachers were now requesting copies and the friend was making several hundred dollars a week marketing the shorts while continuing to teach. Fierlinger stressed the power of the internet, both in terms of making sales but also for doing research and for collaborating. 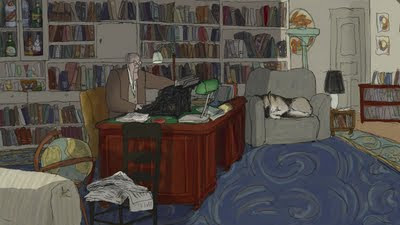 Fierlinger was able to research the location of My Dog Tulip without traveling to England thanks to the internet and he found Shay Lynch, the composer for his next film (on John Slocum, the first man to sail around the world solo), after hearing his work on The Animated Life blog on the New York Times. Fierlinger has been freelancing continuously for 51 years and his example is a good one for animation students, who often only think of landing a job at a studio. His determination to work with his own artistic style and his ability to deal with adult content in films like A Room Nearby and Still Life with Animated Dogs, point in directions that students need to consider. 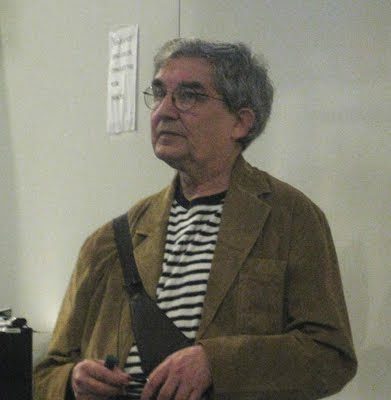 On Wednesday evening, Don Hahn made an appearance at Sheridan College. The event was held in the large theatre on campus and over a hundred students were still turned away. Hahn did a presentation about Walt Stanchfield, artistic inspiration and the production process. After his presentation, he signed copies of his recent books. Hahn was also in town for the Toronto International Film Festival, where his documentary Waking Sleeping Beauty was screening. The film is about the revival of Disney animation in the 1980s and '90s. Walt Stanchfield was a Disney animator who taught drawing extensively at the studio. Stanchfield's notes on various drawing and animation topics have circulated in photocopy form for years, and Hahn has compiled the notes into a recently published two volume set called Drawn to Life. The presentation on Stanchfield included lots of his art and several videos of him teaching at the Disney studio. Hahn showed a great many pieces of illustration art that inspired Disney's original artistic crew and more recent work that had an influence on the newer generation. Not by design, Hahn started off by taking the opposite tack from Fierlinger, saying that animation is a team sport and talking about the pleasures and necessities of collaboration. He stepped through the entire production process, showing sample art and video for each step. He showed rejected character designs and played a bit of the first version of "Circle of Life" to make the point that you want to fail fast and fail often. It takes going down wrong paths before you find the best solution and the collaborative process allows for many more variations to be examined before the best solution is found. 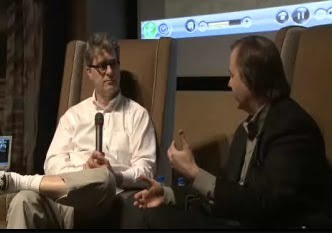 Hahn was enthusiastic for the future of animation and drawn animation in particular, saying that he greatly admired what he had seen on The Princess and the Frog, but should it fail at the box office, Disney would still continue to make drawn features. He talked about how international animation has become and the many opportunities thanks to that and technology that were not available when he started. He was excited to see what films would be made in the next 10 years by the people who were currently students. Hahn was asked what his most pleasant working experience was and he answered that it was working on Atlantis. While he admitted that the people had to judge for themselves how successful the film was, he said that he was working with people he had known for 10 years and very much liked. By contrast, the toughest working experience he had was on Beauty and the Beast, where the production had to deal with Howard Ashman's death, having its budget cut and Hahn having a child during production. The last guest of the week was Joe Haidar, a veteran animator who has worked in Canada, England and the U.S, including 15 years at Disney. Joe was in Toronto to visit friends and family and brought along Animated American, a live action and animated short film he co-directed with James Baker and that was produced by Susan Cohen. I had Haidar as a guest in my second year lecture, though many third and fourth year students sat in. He screened the complete film and then talked about how the film was made. When he and Baker were laid off at Disney, they decided to do something for themselves rather than just look for another job. The two wrote the story and then brought in screenwriter Tim Talbott to polish the script. The live action was shot over 4 days and then Haidar and Baker did the bulk of animation themselves over more than a year. Haidar was surprised and sorry to discover that people from live action were far more cooperative and generous in helping the film get made than people in animation. He also mentioned that when they started the film, they realized that they knew hundreds of artists, but no business people and he suggested to the students that they don't limit their professional relationships to other artists. Animated American is currently playing festivals and Haidar and Baker are planning to do a live action feature as their next project together. The best thing about these guests is their varying viewpoints. Fierlinger is the lone independent, Hahn is the corporate team player and Haidar is the new director looking to launch his own projects. If nothing else, they demonstrate that animation, as an occupation and a medium, has greater possibilities than many people realize. Jamaal Bradley has set up a blog that collects pencil tests from all around the web. Right now there are pencil tests from Tarzan, Treasure Planet, Curious George, The Aristocats, The Jungle Book, Nocturna, Sinbad and Lady and the Tramp. Consider it your one stop shopping destination for pencil tests. 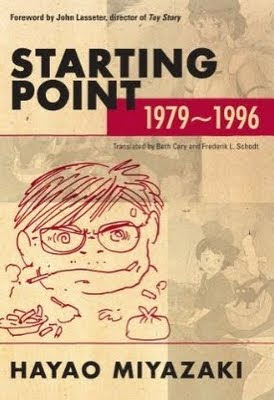 This book, a collection of articles and speeches by director Hayao Miyazaki as well as interviews with him, is one of the most important books on animation ever published. It contains almost no pictures; instead it is a book of philosophy and observations that reveal Miyazaki to be as perceptive and articulate as anyone who has worked in animation. It isn't necessary that creators be able to write or speak intelligently about their work. I greatly admire director John Ford, who actively disliked interviews; he would take sadistic pleasure in abusing interviewers and left no writings of any consequence. Anything Ford wanted to say he put on the screen and that was more than enough to earn him respect. However, when a director reveals himself in words as well as films, it can lead to an enhanced appreciation of the person and the work. I have admired Miyazaki for quite some time, but I have to say that my respect for him increased enormously after reading this book. Miyazaki has a broad range of interests. Of course, he talks about animation (with interesting perspectives on Disney, Dave Fleischer and Tezuka), but he also talks about politics (Marxism and Yugoslavia), history (particularly Japanese history), technology, children, audiences, mentors, economics and the environment. Having said all this, if someone were to ask me what the most important thing is when creating a new animated work, my answer would be that you first have to know what you want to say with it. In other words, you have to have a theme. Surprisingly, perhaps, people sometimes overlook this basic fact of filmmaking and overemphasize technique instead. There are innumerable examples of people making films with a very high level of technique, but only a very fuzzy idea of what they really want to say. And after watching their films, viewers are usually completely befuddled. Yet when people who know what they want to say make films with a low level of technique, we still greatly appreciate the films because there is really something to them. I was particularly taken with this paragraph on running. There are many animation textbooks that will explain how to do a run, but this single paragraph says more about why you would have a character run than any animation book I've read. The running of surging masses on fire with anger, the running of a child doing his best to hold back tears until he reaches his house, the running of a heroine who has forsaken everything but the desire to flee -- being able to show wonderful ways of running, running that expresses the very act of living, the pulse of life, across the screen would give me enormous delight. I dream of someday coming across a work that requires that kind of running. What Miyazaki is talking about here is the emotional heart of animation -- the emotions that literally animate a character -- not simply the path of action of a foot or the spacing between drawings. Miyazaki takes a dim view of the production conditions for television. What does seem to be a big problem to me, however, is that both the film and TV worlds are always desperately running after whatever carrots are dangled in front of them. The carrots for the TV world are particularly small, truly piddling overall, and for both TV and film projects that pass muster tend to be low risk and highly disposable. For TV today, the biggest problem is the huge increase in the number of shows being made. Everyone's confused about what is being done. No one knows who is making what, or where. And no one is watching what others are making. If you watch something for three minutes, you feel like you know everything about it, even what went on backstage, and then you don't feel like watching the rest. In reality, it's impossible for creators to keep working at the same pace year in and year out. The harder it is to try to make one good program, the more difficult it is to achieve that same level of quality over and over again. If you really want to create good shows year in and year out, you have to create an organization or system that makes this possible. But in the world of TV animation, it's physically impossible to create a series where each episode is like a theatrical feature. Since we have to cram shows into a system of mass production and mass marketing -- and keep pumping episodes out in such a tight cycle -- it's only natural that the works eventually become anemic. I think that's the point where the industry is now. Miyazaki considers the appeal of animated films. I like the expression "lost possibilities." To be born means being compelled to choose an era, a place, and a life. To exist here, now, means to lose the possibility of being countless other potential selves. For example, I might have been the captain of a pirate ship, sailing with a lovely princess by my side. It means giving up this universe, giving up other potential selves. There are selves which are lost possibilities, and selves that could have been, and this is not limited just to us but to the people around us and even to Japan itself. Yet once born,there is no turning back. And I think that's exactly why the fantasy worlds of cartoon movies so strongly represent our hopes and yearnings. They illustrate a world of lost possibilities for us. And in this sense I think that the animation we see today often lacks the vitality of older cartoon movies. Economic constraints in production are often said to be the main reason, but it seems to me that something spiritual is also missing. It would be stupid to turn my back on the times in which we live and act arrogrant about it all, but I always find myself thinking that the old cartoon movies were indeed more interesting and exciting that we have today. But while animation can serve a spiritual purpose, it's also tainted by commercialism. After working in cel animation for so many years, I've recently become more away of the things I have been unable to do, rather than the things I have been able to do. I still think that encountering wonderful animation as a child is not a bad thing. Yet I'm also acutely aware that this profession is actually a business, targeting children's purchasing power. No matter how much we pride ourselves in being conscientious, we produce visual works that stimulate children's visual and auditory senses, and whatever experiences we provide them are in a sense stealing time from them that otherwise might be spent in a world where they go out and make their own discoveries or have their personal experiences. In the society in which we live today, the sheer volume of material being produced can potentially distort everything. Miyazaki's view of life is nuanced. I think there is is no way we can live and "not cause difficulties for others," as the saying exhorts us. I have come to think that even when we are overflowing with love and goodness, the world of human beings is one in which we cast our shadows onto each other, giving each other troubles as we grow and live. The question then becomes, what it is hope? And the conclusion I'd have to venture is that hope involves working and struggling along with people who are important to you. In fact, I've gotten to the point where I think this is what it means to be alive. As I said above, it isn't necessary for a director to say anything beyond what's on the screen, but reading Miyazaki, I'm convinced of the intelligence behind his films. I wish that intelligence was more widespread in animation today. Disney's purchase of Marvel has generated a lot of discussion about the specifics of the business deal and the potential synergies, but what I see is one creatively bankrupt company buying another. This is Robert Iger's second major purchase for Disney. The first was Pixar at a cost of $7 billion. Marvel went for "only" $4 billion. These purchases have defined Iger's tenure as head of Disney, but not in a way that speaks well for him. While business writers are taken with Iger's boldness, what we have here is someone who doesn't believe that his company is able to compete. When Walt Disney moved into live action, he didn't buy an existing studio. When he went into television, he didn't buy an existing production company. When he went into distribution, he didn't buy a distribution company. When he went into theme parks, he didn't buy an amusement park. In each case, Walt Disney grew his own company and built its expertise in these areas until the company could compete, and in some cases lead, the particular industry. When Walt Disney was interested in accomplishing something, he did it from the ground up. By contrast, when Robert Iger needs to compete in computer animated features or to capture a larger share of the young boys audience, he pulls out the corporate wallet and buys what he needs. Consider the numbers involved. Let's say that it costs $250 million to make and market a cgi family feature. For the $7 billion Iger spent on Pixar, he could have made 28 feature films. With 28 kicks at the can, a company could try a wide variety of approaches and techniques in trying to succeed with audiences. One of the areas that the Marvel deal is supposed to help is the Disney XD cable channel. Let's say it's going to cost $15 million to create 13 episodes of a TV series (a very generous budget for cable). For $4 billion, Disney could create 266 TV series in an attempt to attract the boy's audience. With those kind of resources, it's appalling that the company never made a serious attempt. And what exactly has Disney bought in buying Marvel? While Marvel recently celebrated it's 70th anniversary, the truth is that the company was creative for approximately 10 years of that time (1939-40 and 1961-68). If you were to remove six people from Marvel's history -- Carl Burgos, Bill Everett, Joe Simon, Jack Kirby, Stan Lee and Steve Ditko -- you would remove the majority of the characters that define Marvel and the ones that are left are based on examples created by these six. Marvel has had success recently in creating films based on its characters, but the characters are all more than 30 years old. The company's attitude towards creators guarantees that no new characters will be forthcoming. Marvel took ownership of the work of its writers and artists (even when those people were independent contractors and not employees), but the bigger blunder was to withhold profits or royalties from those creators. As the characters gained popularity and began to generate real money, the creators finally figured out that they would see none of the wealth they created, so they stopped coming up with new ideas. Jack Kirby and Steve Ditko both left the company as a result of broken promises for compensation. Steve Gerber and Marv Wolfman both sued the company to regain ownership of Howard the Duck and Blade, respectively (and lost). In the '90s, a group of artists split from Marvel to form Image Comics precisely because they realized that they would never receive a fair deal there. Marvel's history of dealing with creators has guaranteed that the very characters that Disney covets are finite in number. When Disney bought Pixar, they were buying a future: Pixar was still generating new films and characters. John Lasseter and Ed Catmull, two people responsible for Pixar's success, were still with the company and still attracting audiences. By contrast, buying Marvel is buying the past. The characters are already decades old and the people who created them are no longer with the company. In this sense, the purchase of Marvel is closer to the purchase of the Muppets than the purchase of Pixar. Time will determine if the purchase of Marvel was a good one or not. However, the pattern that Iger has established doesn't speak well for Disney's future. Creators need places where they can try things free from a corporate bureaucracy and where they can share in the wealth that they create. Disney would prefer to let those things happen elsewhere and then buy them after the fact.